And then a mysterious package appears at the bookstore. It's a small package, but large in weight. 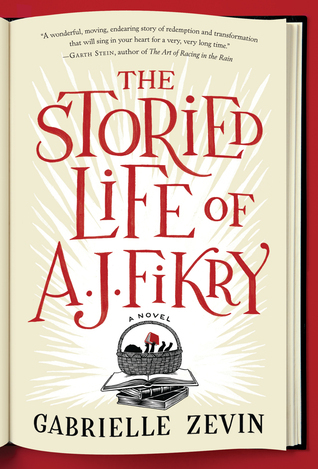 It's that unexpected arrival that gives A. J. Fikry the opportunity to make his life over, the ability to see everything anew. It doesn't take long for the locals to notice the change overcoming A.J. ; or for that determined sales rep, Amelia, to see her curmudgeonly client in a new light; or for the wisdom of all those books to become again the lifeblood of A.J. 's world; or for everything to twist again into a version of his life that he didn't see coming. This is a book for book lovers. It also, kind of, shames book lovers to be honest. A. J. Fikry isn't really a nice guy. He's judgmental, abrupt, and lacks a sense of humor. He's a "literary fiction" kind of guy, looking down on those who read just to enjoy. The lovers of fluff. 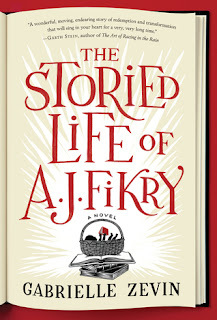 A. J. Fikry is a book snob. But his world changes because of a book and a town found comfort, love, and friendship in his small island bookstore. This was one of the many audiobooks I've been devouring over the last couple of months. It was the perfect car book...short...and for my quick commute each morning, I got through it before it was due (which hardly ever happens). I almost didn't finish it though. The reader was all snark, and for awhile, it really put me off Fikry. He had a tone to his voice that was super annoying and really rubbed off on the character development. Was what I was feeling toward the character intended by the author? Or was it the reader's inflection that was forming the character in my head? That can often make or break an audiobook. But I stuck with it, and I'm glad I did. I couldn't help feeling like I was supposed to get something out of this. I suppose a lot of times I expect there to be a big message, an underlying theme, a lesson to be imparted, a deep, insightful epiphany. But there wasn't. This was a story about a man. It was also a story about pain and loss, new beginnings, and love. And maybe that's all the story was supposed to be about. A decent read. Not my favorite Gabrielle Zevin selection, but worth the listen nonetheless.